This page has been viewed 9 times this month, and 1849 times total. Originally Released in Sep, 1961 (Estimate). Return To "Snip And Snap (Series)"
I remember having last seen this cartoon when I must have been about three years old. The one episode I recall from that time featured what must have been the title character, the paper dog Snap, sailing across a paper sea of two dimensional waves in his paper boat. Snap was being pursued by a bull dog (this may have been the paper dog character Snarl; the one other paper dog character, Sniff, I believe was a scottie dog... someone please correct me on this if I'm wrong), whom I believe was in another boat. That's all I remember of that particular cartoon episode from that time (I now guess that this cartoon may have been "Lone World Sail", one of the 27 or so total "Snip and Snap" cartoons produced in the very early 1960s). Well, I often watched television for a few years after having seen this episode of "Snip and Snap" in the hopes of seeing more of these cartoons. Never saw them at that time. I did liik up, in cartoon books and such, little bits of information about the cartoon. 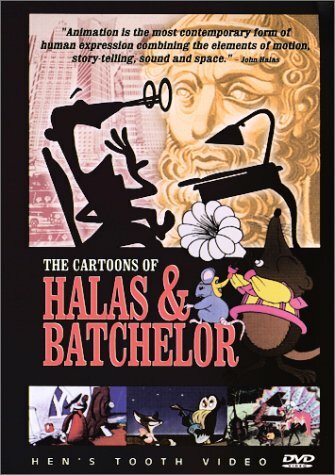 I discovered that it was put out by Halas and Batchelor, a husband-wife team from Britain (they are perhaps most famous for having produced the cartoon version of George Orwell's "Animal Farm"). In any case, with the advent of the internet I began to search for more facts about "Snip and Snap". Slowly, more and more information has become available. One website even has some pictures from the cartoon (thought I'd never see even that!). Last fall (2002) I discovered a website through which I could order old Halas-Batchelor cartoons. Curiously enough, Vivien Halas, daughter of Halas and Batchelor, oversees this website. Through a telephone call to her, she informed me that one episode, "Snap Shots", of the "Snip and Snap" series was available for purchase. I obtained this one episode, fully expecting that the cartoon itself would be of rather poor quality (I have often had the experience of revisiting cartoons many years after I first saw them and being amazed at how poor some of the quality was... but the nostalgia bug usually more than makes up for lack of animation quality). Well, this episode, "Snap Shots", was superb and I hope rather representitive of the general quality of the "Snip and Snap" cartoon series. What impressed me especially was the detailed use of sort of 2 to 3-dimensional paper dogs in rather sophisticated animation ways. For example, the dogs faces will show expression. Three dimesional props abound and normally inanimate objects (such as a tripod camera) come to life and have a mind of their own. It must have been fun to make these cartoons. Moreover, the jazzy, relaxed music that accompanies the episode is an excellent accompinament. All in all, I think younger kids could not help but be entertained by this cartoon. Adults will likely appreciate the clever use of paper cut out dogs in a three dimensional world. The entire cartoon is filmed in black and white. Hopefully, some or all of these "Snip and Snap" episodes will become available some day. This would likely considerably lower the cost of the video as the one episode that I obtained was not cheap (it had to be put on American VHS format from the PAL format it was on... this added to the cartoon's already high cost). Presently, film reels of these cartoons are contained in an archive within a library in England (perhaps in London?) along with many other Halas-Batchelor cartoons. Snip And Snap (Series) by Big Cartoon DataBase is licensed under a Creative Commons Attribution-NonCommercial-ShareAlike 4.0 International License.